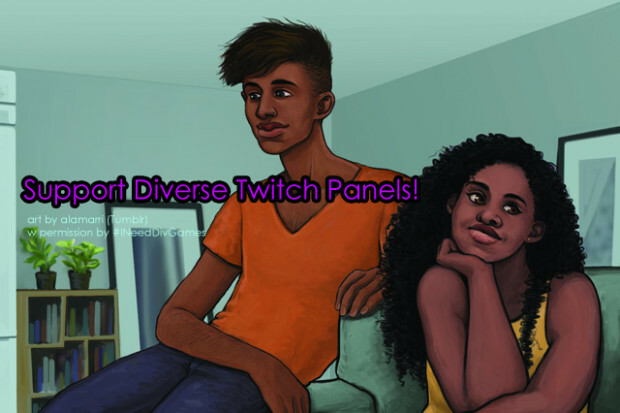 Overview: This campaign is aimed at helping the panelists on the “Mental Health and Tabletop Role-Playing Games” panel and the “Being Political on Twitch” panel afford the expenses of attending TwitchCon 2017 (Oct 20-22). Our panels are diverse and many of us need financial support to be able to attend. We’re setting our goal high with the hope that we can make real change happen at TwitchCon and afterwards! We would like to attend TwitchCon this year (Oct 20-22) and support change for conferences in the future. Not every panelist needs financial assistance, but four of us really need your help. We have a long-term goal of making Twitch events like TwitchCon more accessible. It’s a huge financial undertaking for individuals to attend – especially marginalized people. We need your help to attend this year as many of us have no substantial income. Part of the power in attending a conference in person is being able to talk more easily with others, meet people who share your interests and passions, and provide different voices and content to panels. Our shared goal in attending is also to work with Twitch (community members and employees) to create future conferences with accessibility in mind so that it’s easier to attend and share our ideas and knowledge. We’ll be streaming regularly, making comics, and blogging so that you can help us get to our goal! How do tabletop role-playing games support people with mental health disabilities? This panel engages with how the constraints and designs of tabletop RPGs on Twitch provide a space for people to alleviate pressures related to agoraphobia and social anxiety. Panelists that Need Your Help! Tara cannot currently afford to go to TwitchCon *at all*. She needs help with airfare, accommodation, and food! She is a freelance illustrator and designer, and full-time night school student at Dawson College’s Independent Game Design program (woo!). Tanya, Andrew, and Jenna need help with various expenses, but mostly with airfare and accommodation! We’ve set goals to help us make this endeavor possible! $1500: Tara can afford flight & hotel and gets to go to TwitchCon! $2500: panelists who need it can have their accommodations compensated! $3500: panelists who need it can have their accommodation and airfare compensated! $2500: We will blog and vlog our experiences at TwitchCon and provide mini interviews, photos, write-ups of different panels, and general info! $3500: We’ll set aside a chunk of time to meet with Twitch employees and discuss ways to improve the accessibility and conference for *all* people! Attending conferences is a privilege and we would like to make sure that more voices can be heard and more people can attend these events! We’ll report all information with full transparency as we continue to work and continue to work well past October! Describe your plan for solving these challenges. Conferences attendance is a privilege. If we can’t meet our goals, Tara will opt out of TwitchCon and put *any* donations directly towards the panelists that need it and pay Tanya to be a moderator for the panels. Help us make Twitch events more accessible! Adam Koebel: co-designer of award-winning tabletop RPG “DUNGEON WORLD”. He’s also a twitch streamer and GM of RollPlay, home of many exciting RPG properties like Swan Song and Court of Swords. He’s the GM-in-Residence (oooh fancy) at Roll20.net. Adam is a queer person and advocates openly for inclusivity and diversity in all his work. Brian aka “Citizen”: an organizer of Twitch’s Unity program, is an organizer and advocate for better tools and conduct for Twitch’s streamers and users. Tristarae: is part of the Misscliks, an amazing DM and GM, stream moderator, and streamer! Trist is open about her mental health and advocates for inclusivity and diversity in all her work. Kent: is a game designer, writer, and artist who speaks openly on subjects of mental health and diversity. Supporting our work and some real talk on money.